Take a Port Liner at "Sannomiya Station" bound for Kitafuto direction, get off at "Nakafuto Station". Take a Port Liner from "Kobe airport Station" bound for "Sannomiya Station", then transfer at the third stop "Shimin hiroba Station" bound for Nakafuto, and get off at "Nakafuto Station". ・We are sorry but if it will get overcapacity, you will not able to take the bus. Please come early at the bus station to prevent this. ＊Alternate bus operation with 13 seats and 27 seats.Please be aware that there may be delays due to traffic congestion. ・Shuttle buses will not carry passengers who are traveling only between Sannomiya and Shin-Kobe. ・Passengers may be asked to queue in the lobby at the hotel for the bus depending on the time and number of passengers. ・Shuttle buses cannot be used by large parties. 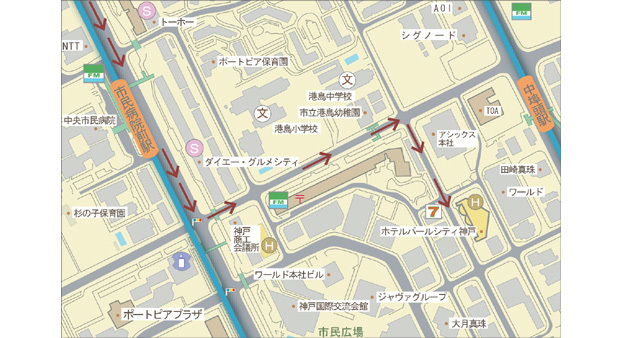 ●Hotel guest can use parking 500yen( tax included) per night. ＊Parkings for high height car and 3 number car are limited, we might introduce contract parkings. ＊Also monthly contract parking is available. Please contact us. ・ The above prices contain a 10% service charge and a 8% consumption tax. ・ Please be aware that the above contact may change.